A Big Hello yo all to my Time for Tea Design friends!!! It's me again, and I'm back to share with you guys my November card! Since it's only a few weeks until the Holidays, I was inspired by Christmas colours! 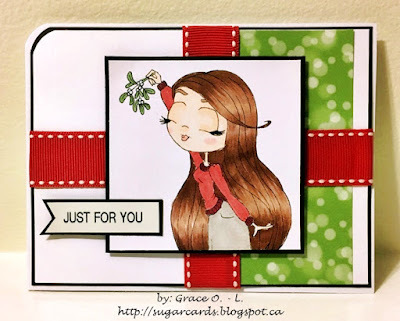 This card was so simple to create, I just used my Michael's Crafts red ribbon, copic markers, Lawn Fawn - Bokeh in the snow paper pad, my P-touch label printer for the sentiment and wink of stella for her sweater. Easy Peasy for the Holidays! So if you love this digital image as much as I do, please head over to Time for Tea etsy stop ! OR JOIN OUR NOVEMBER CHALLENGE AND WIN THIS DIGITAL IMAGE! and a Happy Thanksgiving to my American Family and Friends! !